Shauger Hill Trail is a wooded 2.1-mile loop with a trailhead and parking area near the contact station at the beginning of Scenic Drive. The hilly trail passes through a climax beech-maple forest, red pine plantations and a few small clearings and twice crosses Shauger Hill Road as well as Pierce Stocking Drive. 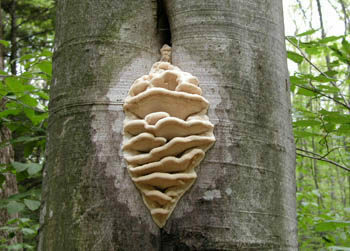 In the spring the trail is an excellent one for wildflowers and to hunt for morels. In the fall the colors are superb and in the winter it’s hills are thrilling runs as part of the Scenic Drive Ski Trail. In the summer, however, it’s lack of outstanding views and shoreline, in a park filled with them, has most people looking elsewhere to hike. When most people stop along Pierce Stocking Scenic Drive in Sleeping Bear Dunes National Lakeshore it’s to enjoy the spectacular overlooks of Glen Lake or Lake Michigan, have a picnic or hike the Cottonwood Trail. But the 7.4-mile scenic road also provides access to a second trail that receives light usage even at the peak of the busy summer season. Shauger Hill Trail is a wooded 2.1-mile loop with a trailhead and parking area near the contact station at the beginning of Scenic Drive. The hilly trail passes through a climax beech-maple forest, red pine plantations and a few small clearings and twice crosses Shauger Hill Road as well as Pierce Stocking Drive. 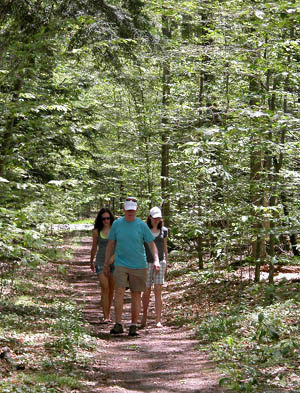 In the spring the trail is an excellent one for wildflowers and to hunt for morels. In the fall the colors are superb and in the winter it’s hills are thrilling runs as part of the Scenic Drive Ski Trail. In the summer, however, it’s lack of outstanding views and shoreline, in a park filled with them, has most people looking elsewhere to hike. That makes Shauger Hill Trail the ultimate escape from crowds. Even when the viewing decks are packed and Pierce Stocking Scenic Drive is lined with slowly crawling vehicles, you will encounter few if any other people on this foot path. And, of course, no mountain bikes as their activity is banned from almost all the national lakeshore trails. 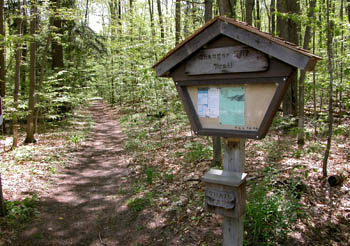 The trail is accessed from the parking area reached just before the contact station for Pierce Stocking Scenic Drive, just off M-109. At the east end of the large parking area is a trail display with a map box. From the trail quickly crosses Scenic Drive and then Shauger Hill Road and begins a steady uphill climb. At one point you’re treading between two wooded dunes before topping off in a half mile. You begin descending, bottom out and resume climbing briefly at Mile 1. Within a third of a mile you cross Shauger Hill Road a second time and at Mile 1.5 reach a junction map that is signposted as Scenic Drive Ski Trail. Head west and you’ll climb to Scenic Drive near North Bar Overlook. Head east (right) and the trail makes a sharp descent followed by an equally sharp ascent that no doubt befuddles a few skiers in the winter. From the ascent the trail begins a long gentle descent that lasts for a third of a mile or until you hear the traffic on Pierce Stocking Scenic Drive. From the junction to the paved road is a half mile and by far the most interesting stretch of the loop. Once across Scenic Drive, the parking lot and trailhead is less than a quarter mile away. In the trailhead parking area for Shauger Hill Trail is a display sign, map box and a vault toilet. From Empire head north on M-22 and then veer to the left on M-109. Within 1.5 miles you pass the posted entrance to Pierce Stocking Scenic Drive to the west.